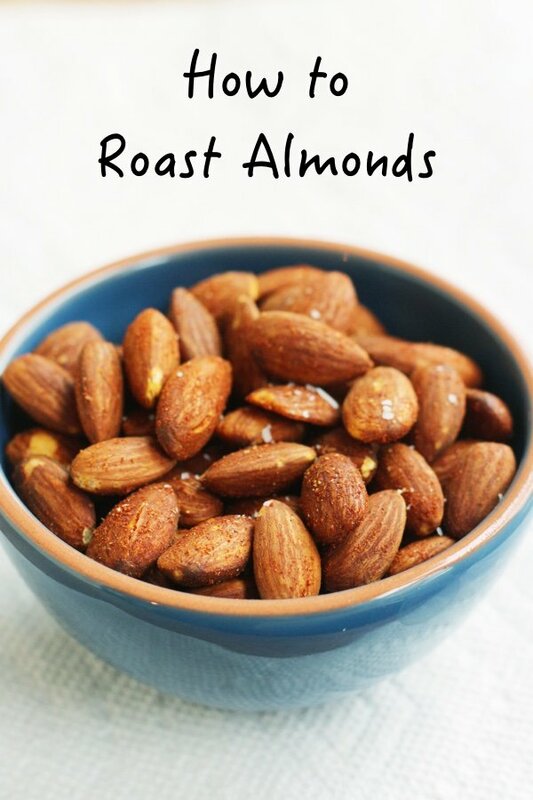 How do you roast almonds? It is pretty simple and can turn a boring snack into something far more exciting. I love roasting nuts – I have a bunch of roasted walnut recipes and a very popular smoky roasted chickpeas recipe – which is almost like a nut. Roasting and flavoring almonds rather than buying them already salted allows you to decrease the amount of salt and make them your own. This recipe calls for almonds and not raw almonds because the plain almonds (no flavorings) you see in the bulk section are roasted already. But, you can roast them at home to make them crunchier and tastier. The packaging just says “almonds” not raw almonds – and that is what you are looking for. I bought these at Costco which has great prices for bulk nuts. The nuts also taste fresher and have a better crunch when you make them yourself. This method isn’t hard at all and will save you money. 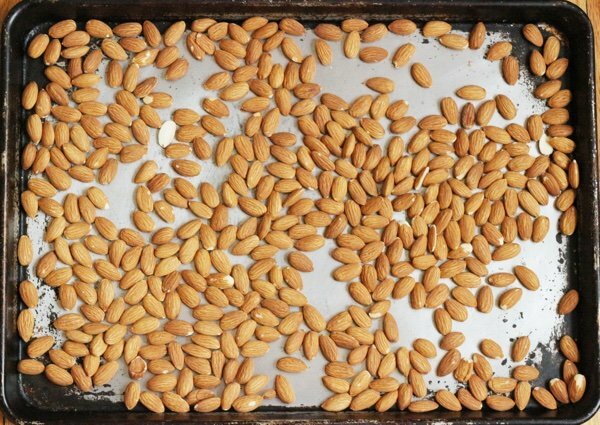 All you do is spread out the almonds on a rimmed baking sheet and bake for 10-15 minutes until slightly browned. Then you can leave them naked or add some flavoring agents. I added a little bit of olive oil to help the salt and smoked paprika stick to the almonds. You can add black pepper, cayenne, Cajun seasoning…..whatever you like to make these pop. When they cool they are extra crunchy and tasty. I store them in an airtight plastic container and put them in small baggies for my purse or backpack so I am not tempted to buy crappy snacks when I am out and about. The fat and protein (as well as the CRUNCH) makes these deeply satisfying and will hold me until the next meal when I am feeling peckish. Have you roasted your own nuts? How do you flavor them? Heat oven to 350 F. Spread almonds in one layer on a rimmed baking sheet. 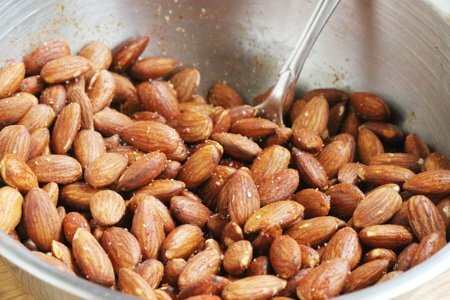 Bake for 10-15 minutes until almonds are slightly browned. Be careful not to burn them by checking on them often. 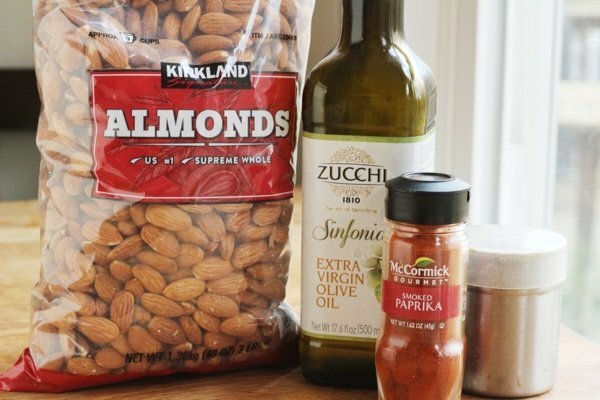 Mix roasted almonds with olive, salt, and smoked paprika until you get your perfect combination. Store in an airtight container for weeks on your countertop. I like to start with raw almonds from the bulk bins which taste fresher to me. I roast like you describe, although maybe at 325, but test them by biting one in half to look at the color. It should be a very pale brown. Over-toasted will look definitely brown. I had heard that roasting almonds turns the good fats in them into bad fats? Is that true? That is the reason I don't roast nuts... if that isn't true then yippee!!! I can have them again that would be great😁!! @Lori - I have never heard that before. I looked it up and this is what I found - The nutrient content of the nuts might differ slightly from their raw counterparts, but the roasting process doesn't turn the healthy fats into unhealthy fats. Roasting nuts over 100 degrees Celsius will unfortunately alter the composition of the good ‘unsaturated fats’ to bad ‘saturated fats’! Please check your theories thoroughly before stating such claims. Slow roasting at under 100 degrees Celsius for 4-6 hrs will maintain the stability of the ‘good’ saturated fats therefore making this method the healthier and beneficial choice long term.